FLEET OPTIMIZATION give earlier warnings of the likelihood of any failure risks,” says ARC’s Anantharam. McKinsey consultants who authored a July 2012 paper, “Why Big Data is the new competitive advantage,” published in the Ivey Business Journal. Of course, there are technological obstacles in general, and particular to shipping, that needs to be resolved before there is likely to be any mass adoption. These include communica- tions costs, retrofi tting aging ships, data storage and manage- ment, and the need in some cases to convert analog sensors to digital signals. One of the biggest causes for pause for many companies is the cost of satellite communications. Before you can analyze your data, you have to get it off the ship. But while ESRG’s Bradenham insists satellite costs have fallen to less than $1 per megabyte, he also says connectivity doesn’t have to be a sticking point. It’s all a matter of how often the shore side offi ce wants to get data feeds. For some companies – a couple of times a day is suffi cient. Where companies have broadband, and crew connectivity is considered a priority, it’s easier to send hourly or more frequent data streams. ARC has broadband and sends updates every 2 minutes. “We are looking at having an essentially instantaneous import from the ship,” says Anantharam. ARC has ambitious plans for taking advantage of its data stream. 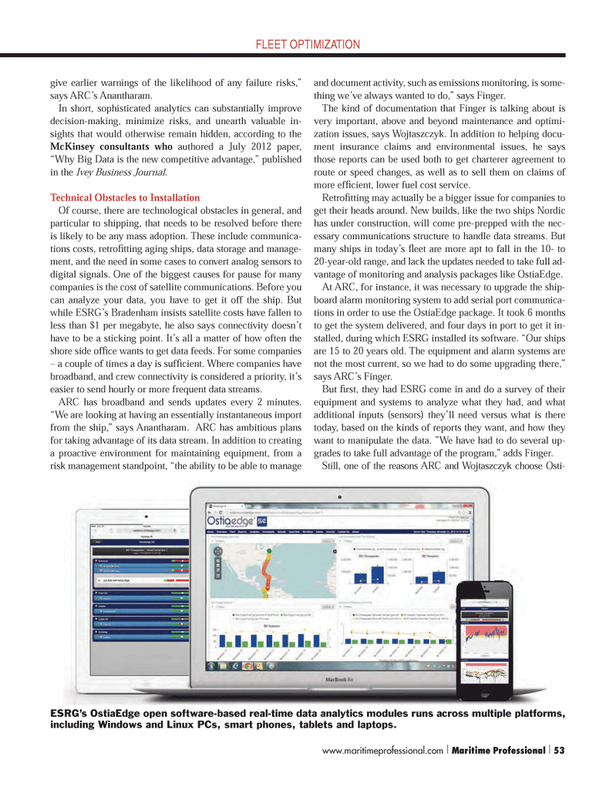 In addition to creating a proactive environment for maintaining equipment, from a risk management standpoint, “the ability to be able to manage and document activity, such as emissions monitoring, is some- thing we’ve always wanted to do,” says Finger. The kind of documentation that Finger is talking about is very important, above and beyond maintenance and optimi- zation issues, says Wojtaszczyk. In addition to helping docu- ment insurance claims and environmental issues, he says those reports can be used both to get charterer agreement to route or speed changes, as well as to sell them on claims of more effi cient, lower fuel cost service. Retrofi tting may actually be a bigger issue for companies to get their heads around. New builds, like the two ships Nordic has under construction, will come pre-prepped with the nec- essary communications structure to handle data streams. But many ships in today’s fl eet are more apt to fall in the 10- to 20-year-old range, and lack the updates needed to take full ad- vantage of monitoring and analysis packages like OstiaEdge. At ARC, for instance, it was necessary to upgrade the ship- board alarm monitoring system to add serial port communica- tions in order to use the OstiaEdge package. It took 6 months to get the system delivered, and four days in port to get it in- stalled, during which ESRG installed its software. “Our ships are 15 to 20 years old. The equipment and alarm systems are not the most current, so we had to do some upgrading there,” says ARC’s Finger. But fi rst, they had ESRG come in and do a survey of their equipment and systems to analyze what they had, and what additional inputs (sensors) they’ll need versus what is there today, based on the kinds of reports they want, and how they want to manipulate the data. ”We have had to do several up- grades to take full advantage of the program,” adds Finger.